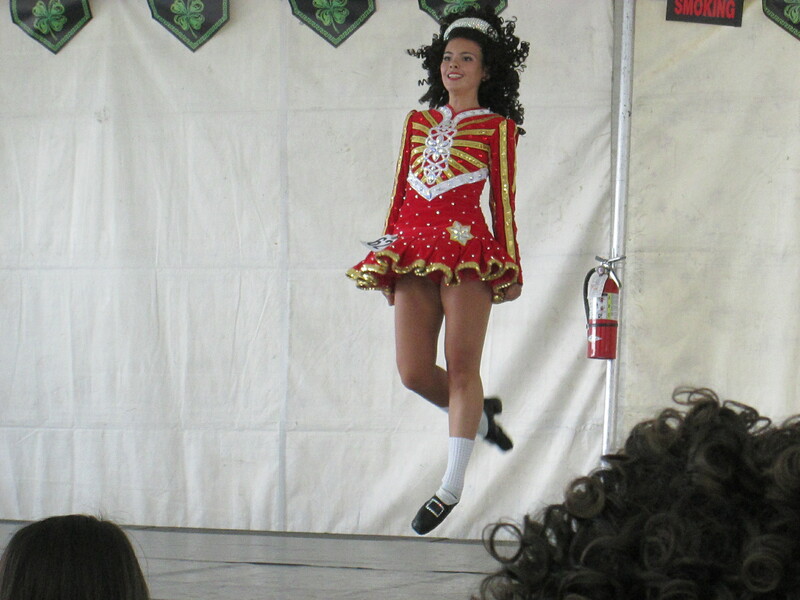 It was time for the Big Irish Fair and Musicfest in Long Beach. So Martine and I headed down to El Dorado Park and sat down for a day of extreme heat and delightful Irish music. 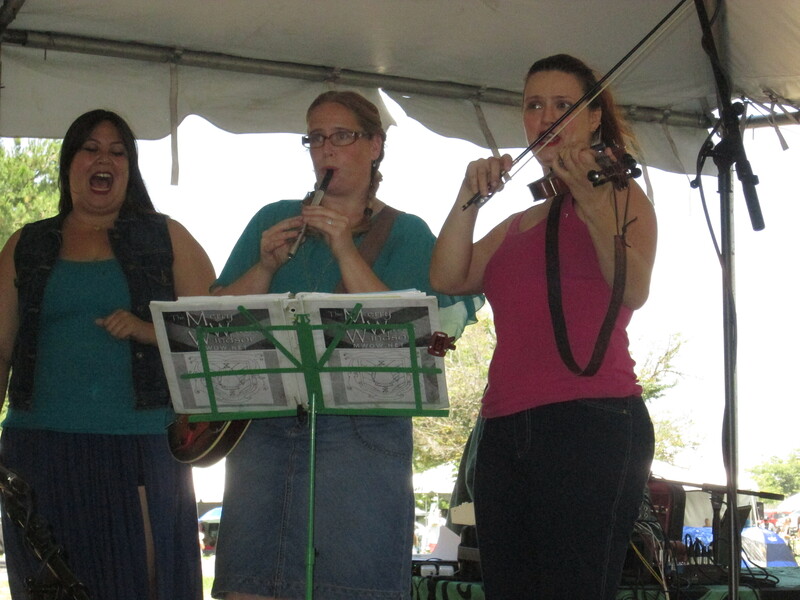 We concentrated on the more traditional groups at the Royal Tara Stage, which included harpists, fiddlers, and the fun girl band who called themselves the Merry Wives of Windsor. Although their website concentrates on their Renaissance Faire appearances, here they were clad in mufti. Conveniently, the stage was in the comfortable shade of several large pines. I was particularly taken with their fiddler, Darien DeVries with her dancing eyes (right, above). They played a mixture of Irish, English, and original music with toasts and jokes between numbers. Also notable was the harp playing of Dennis Doyle, who sang several tunes in Gaelic. Included in his act was (strangely) the best re-telling of James Joyce’s story, “The Dead,” from his Dubliners. 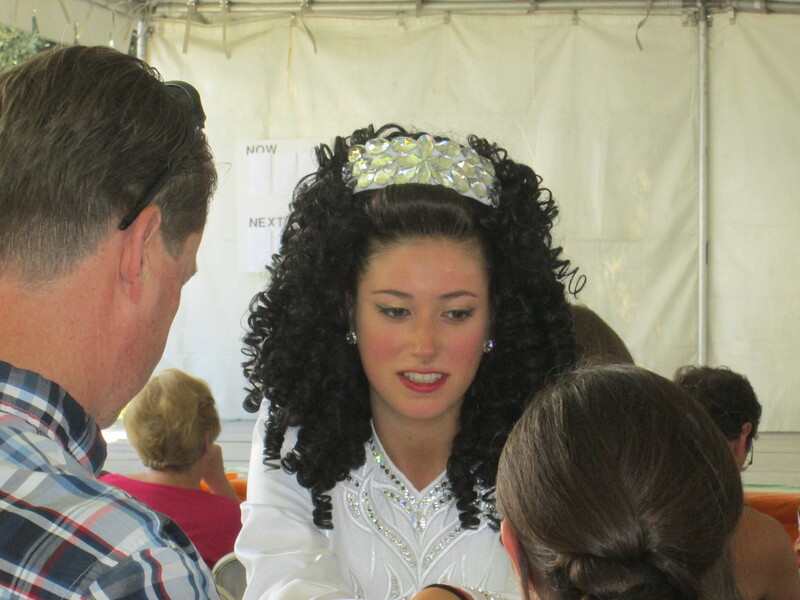 This weekend was the 40th Annual Big Irish Fair and Musicfest, which was held at El Dorado Park in Long Beach. One of the highlights, especially for a dirty old man such as myself, is watching the young girls compete in traditional Irish stepdancing. With their hands held rigidly at their sides, they went into an astonishing series of high kicks. As I told Martine, most of these girls could kick me in the balls twenty-five times before I had time to react to the initial kick. You may remember not too many years ago the fame of one Michael Flatley, who toured the world doing stepdancing in shows entitled “Riverdance” and “Lords of the Dance.” Today, he is retired with severe injuries to his cervical, thoracic and lumbar vertebrae, not to mention his sacroiliac. I wonder how far these lovely young women have to go before encountering similar injuries. 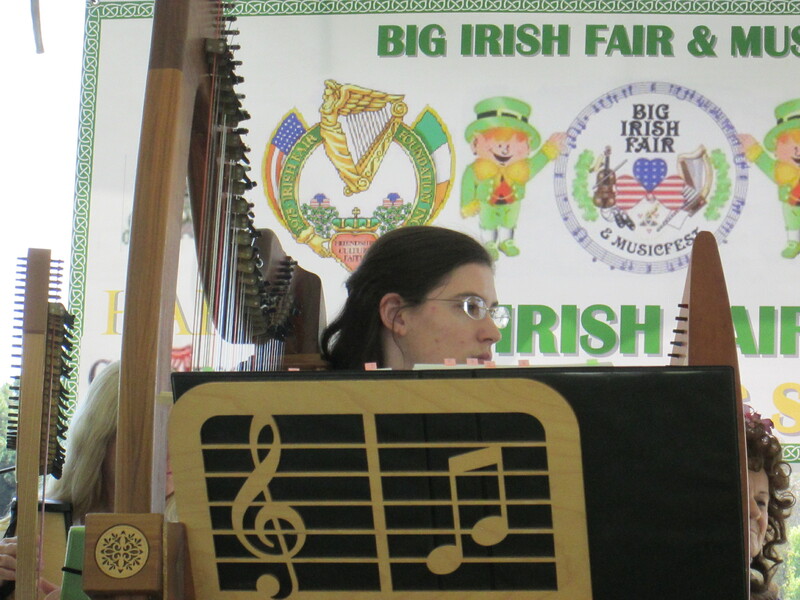 The Big Irish Fair that Martine and I attended last Sunday was mainly for the music (and not to be catapulted into the afterlife by a rampaging sheep—about which see yesterday’s post). Martine and I spent most of our time listening to Celtic harp solos and ensemble playing by a group primarily from Orange County. Soloists included Dennis Doyle and Joanna Mell, who were excellent. Martine was particularly eager to listen to attend as she had never heard any live before. And I enjoyed it as much as she did. 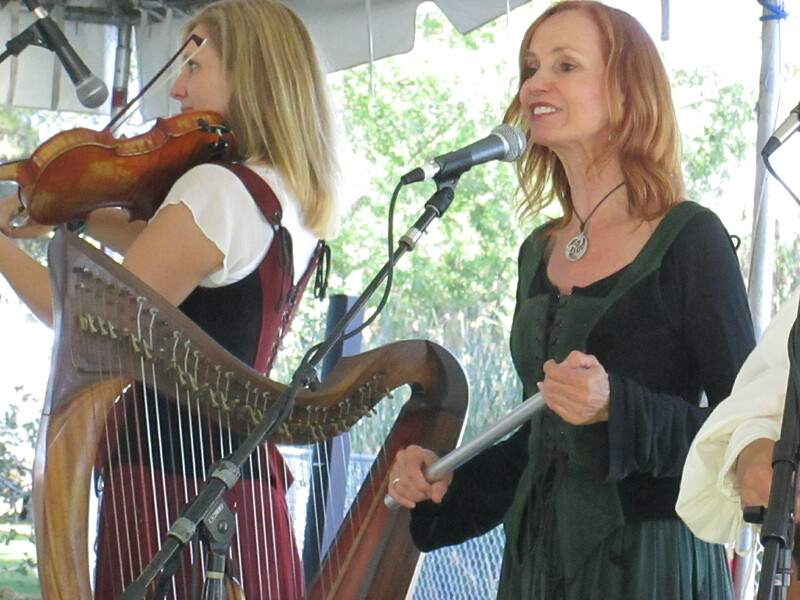 On the same stage where the harps were played, there was also a talented trio from Modesto that performs Celtic music under the name of Golden Bough. I couldn’t get a good photo of all three playing at the same time, so I inadvertently cut out the multi-talented Paul Espinoza. In addition to playing the harp, they also played half a dozen other instruments in their concert of music from Ireland, Scotland, Brittany, and Spanish Galicia. I was impressed at the fact that they kept their end up for more than an hour and a half without taking a break and with no diminution of quality. There was also a lot of bagpiping, but nothing close to the standard of what we heard in Scotland. 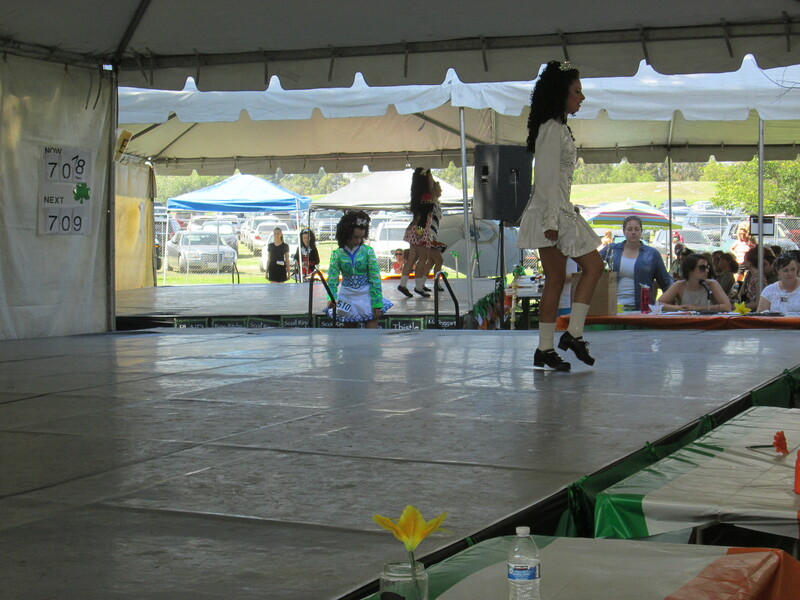 Yesterday, Martine and I went to a large Irish Fair held at El Dorado Park in Long Beach. Thanks to an extremely fine perception of space, I was missed by a fraction of an inch by a charging sheep during the sheepherder dog demonstration.There I was, standing on the sidelines between two tents when, suddenly, someone let the Bouvier des Flandres out of his cage (above), and he charged the sheep, sending them scattering at top speed in all directions. Although the Bouvier was at the show, he was not yet trained to herd sheep without representing a threat to them. The upshot was, I saw my life pass in front of my eyes while being charged by one of the sheep. Before I knew it, all of them had disappeared behind a line of port-a-potties. 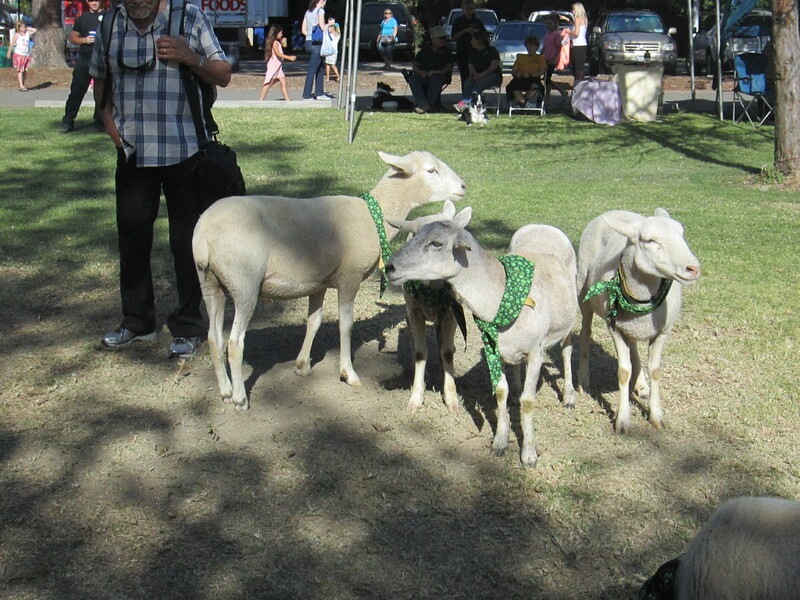 Within ten minutes, however, the real trained sheep dogs had rounded up the miscreant lambchops (see photo below) and brought them back to the demonstration area. 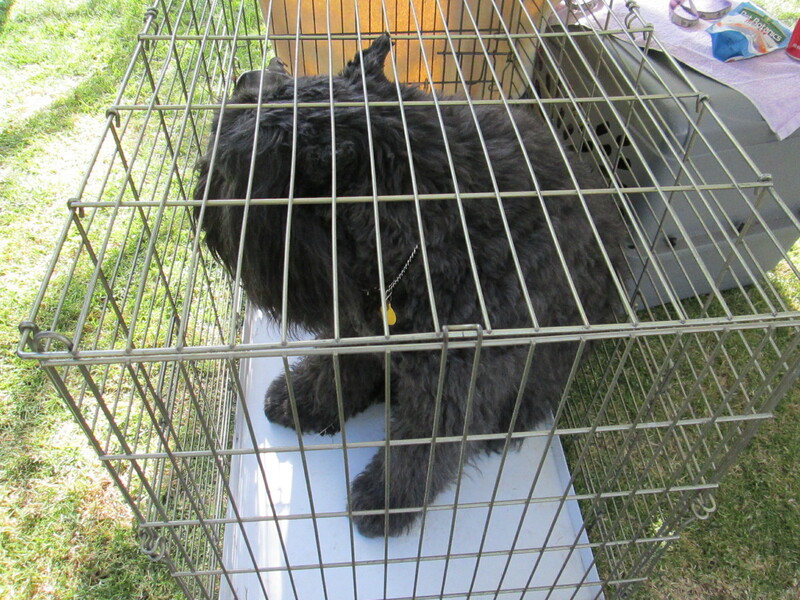 The Bouvier was likewise found and promptly caged. In the end, I found the sheepherding demonstration so interesting that I forgot my former peril. The music at the fair was great (more about that later). The only thing I didn’t like was the food. I never thought of cajun franks, funnel cakes, and kettle corn as being particularly Irish. There wasn’t a trace of lamb stew in evidence, nor even baked tatties. But that’s to be expected when there was a single caterer who brought along a fleet of highly miscellaneous food trucks.